INTRODUCTION: Standards for certain surgical specialties [eg-CT Surgery (CTS)] dictate specialized operating-room (OR) teams. But, increasingly complex General Surgery (GS) cases have not received similar OR team standardization. Research has shown that stable OR teams improve safety, reduce errors, enhance communication/team performance, and decrease distractions. The value of a specialty specific circulating nurse (SpRN) and experienced specialty scrub (ExScr) has not been previously studied. We hypothesized that the presence such team expertise would improve OR teamwork, especially for complex surgical cases. METHODS: We analyzed 2534 OR cases (1880 GS, 654 CTS), (from 2006-2011) using OR Briefing/Debriefing Medical Team data; to determine whether specialties with stable expert teams (CTS) had improved outcomes. Case information, recorded by the OR team, was studied, including: anchor-defined case score (1-5), teamwork notation, personnel, issues, etc. OR Team expertise was defined by presence of SpRN and/or ExScr personnel (0-none; 1-one/either; 2-both). Operative procedures were grouped by degree of complexity (low, moderate, complex). We analyzed differences between GS and CTS cases with respect to team expertise and its influence on reported outcomes; utilizing both univariate and multivariate analysis. RESULTS: GS OR team expertise was significantly deficient compared to CTS (Fig 1). Only 52% GS cases had SpRN vs 79% of CTS cases(P<0.0001). ExScr were present in 91% of CTS cases vs 33% of GS cases (P<0.0001). The same held for presence of either SpRN or ExScr(CTS 96% vs GS 62% of cases, P<0.0001). And, most (51%) complex GS cases had one or none expert OR team members. This expertise disparity significantly influenced team performance (Fig 2). 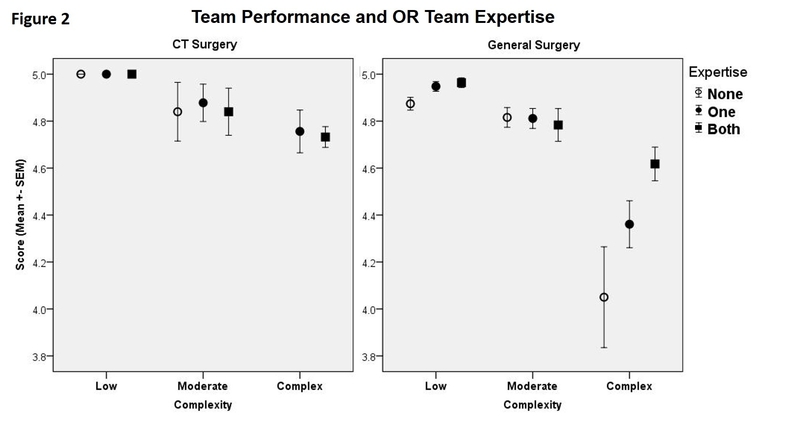 In complex GS cases, lower team expertise significantly correlated with decreased case score (Fig 2); while team expertise had less effect on low-moderate complexity cases. On multivariate analysis, case complexity (P<0.0001) and team expertise level (P=0.002) independently correlated with anchored case score. Notation of good teamwork (on multivariate analysis) also independently correlated with SpRN presence (P<0.0001), ExScr presence(P<0.0001), and case complexity(P<0.0001). CONCLUSIONS: This study provides objective evidence of the value of OR team expertise. Traditionally, CTS OR teams have had stable expert personnel due to the complex nature of their operations. However, GS cases have become increasingly and equally complex, without standards that ensure consistent presence of OR team expertise. Our analysis reveals the significant disparity between GS and CTS operating teams, and how this lack of expertise in complex GS cases had significant repercussions on team performance. As GS has become more complex, the same OR team expertise standards that exist in CTS need to be required for GS cases.